The following is a reference / historical listing of the 70-millimeter presentations of “Fame” in North America. 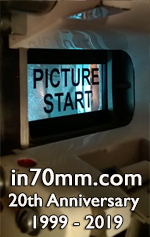 The film’s 70mm prints consisted of pillarboxed imagery (approximately 1.85:1) blown up from spherical 35mm photography. The audio was Six-Track Dolby Stereo (“A” encoded “baby boom” format). The world premiere of “Fame” was held May 12th at the Ziegfeld in New York. The film’s west coast premiere was held May 15th at the Cinerama Dome. “Fame” was among eleven confirmed first-run films released in 1980 with 70mm prints for selected engagements. The MGM release was directed by Alan Parker and opened May 16th. * Screened during the Cinerama Dome’s 25th anniversary film festival, a 17-day, 35-title celebration of popular movies shown at the famous cinema between 1963 and 1988. The information in this article was principally referenced from film industry trade publications and regional newspaper promotion, with thanks to Andrew Coll, Bill Kretzel, Mark Lensenmayer and Paul Linfesty.